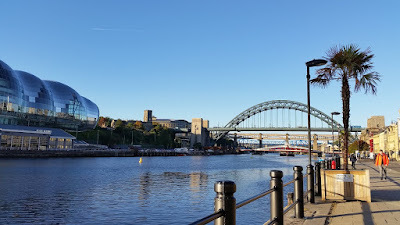 Another sunny morning! 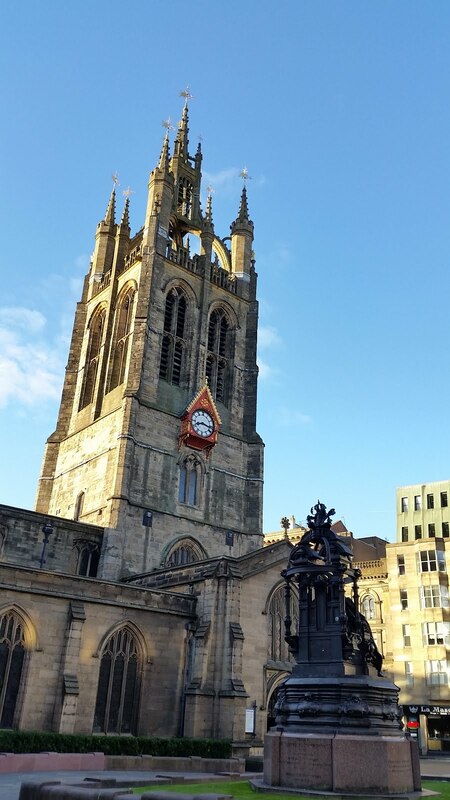 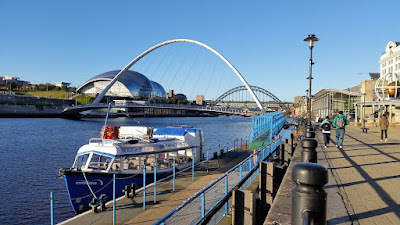 Popped into the cathedral in Newcastle before descending to Quayside and walking eastwards into the morning sun along the north bank of the Tyne. 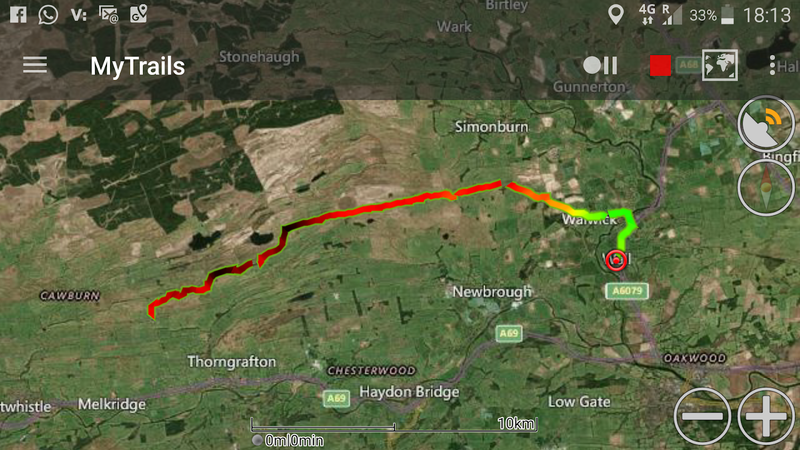 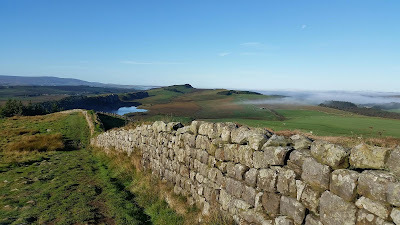 Once out of the city, the trail followed Hadrian's Cycle Path (no. 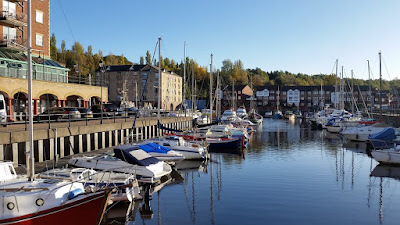 72), passing through suburban parklands and post-industrial wastelands, only some of which have been redeveloped and revitalised like St Peter's Marina. 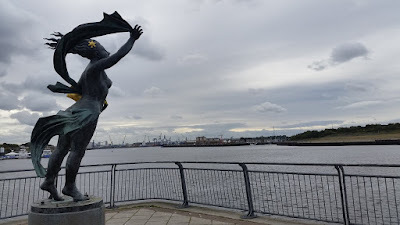 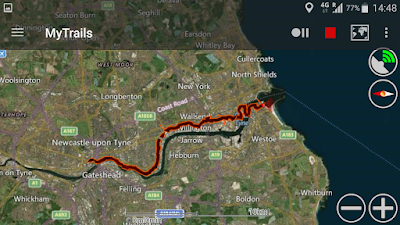 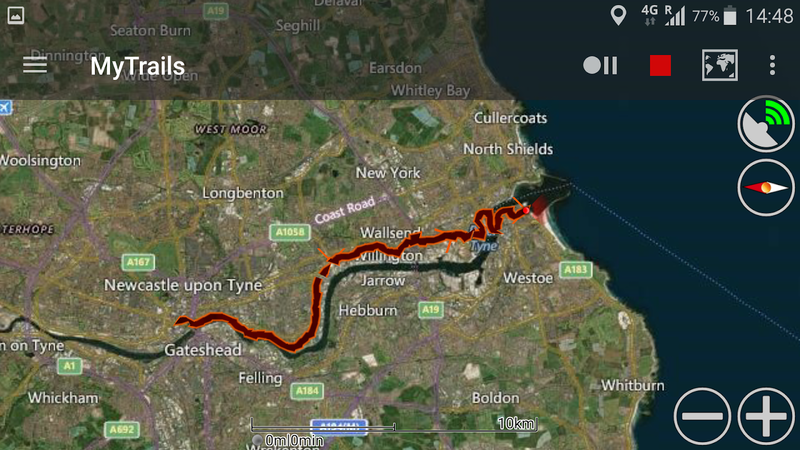 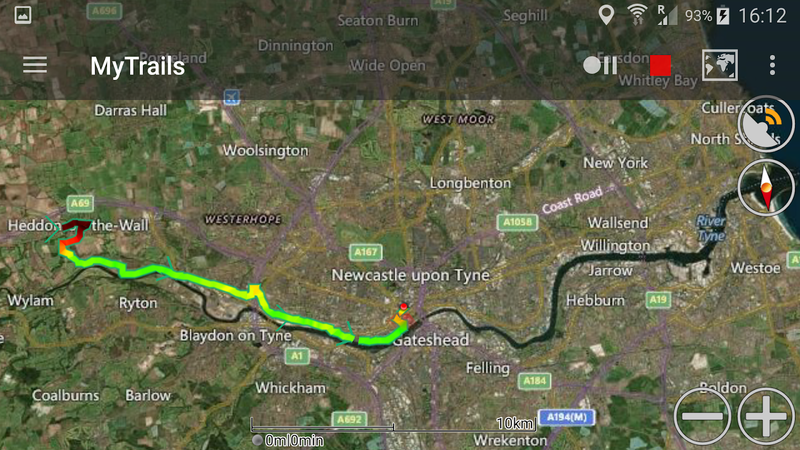 Today's walk may have been less beautiful than many other days on the Hadrian's Wall Path, but it was essential to reach my goal - Wallsend and the North Sea! 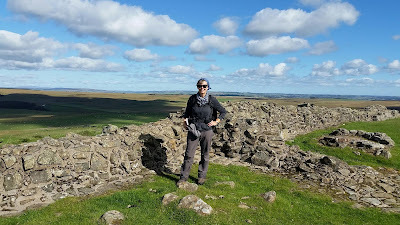 And here it is - the end of the Wall! 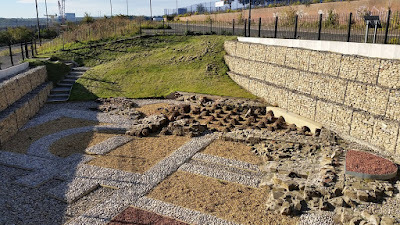 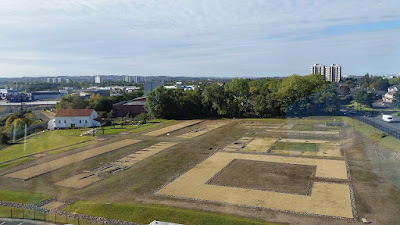 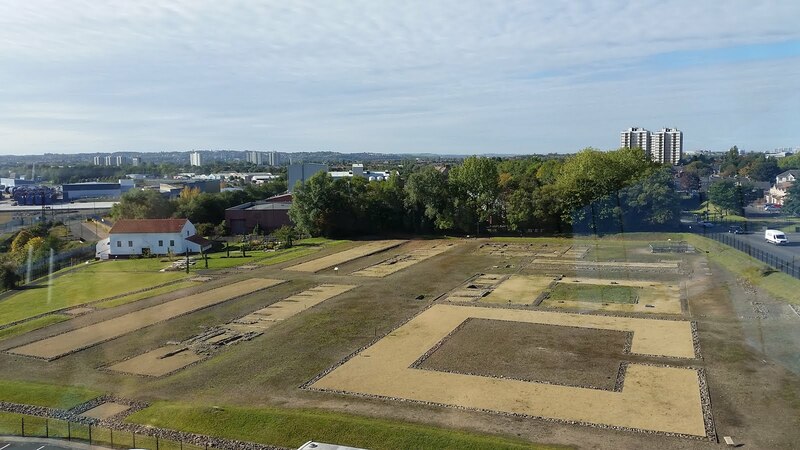 Right below it is the recently excavated site of ancient Roman baths, a reconstruction of which has been built within the grounds of Segedunum Roman Fort and Museum. However, the reconstructed bathhouse, which is supposed to be impressive, was closed because of damage to the roof during last week's windstorm, and several other galleries and "interactive exhibits" in the museum were closed or broken down and awaiting repair, making it a bit of a disappointment for my six pounds. 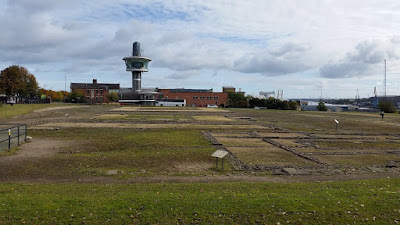 Nevertheless I went up the tower in the glass elevator to look out from the viewpoint over the grounds of the fort and the view of the river and the city in the distance. 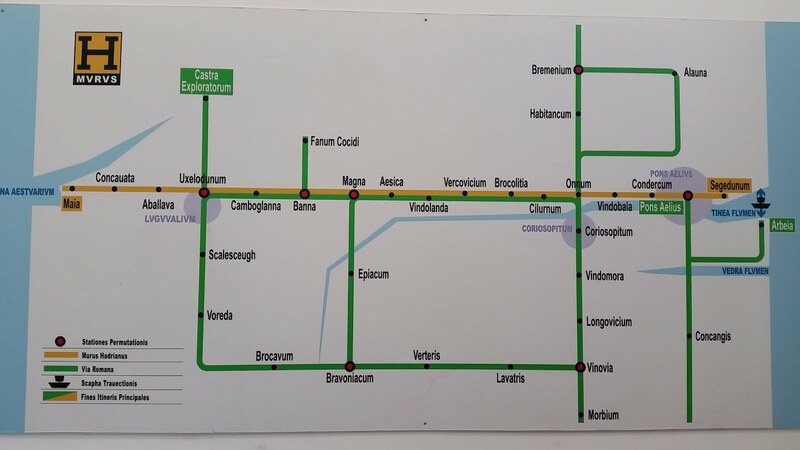 One fun exhibit at the museum showed what Hadrian's Wall would look like if it were a metro system. 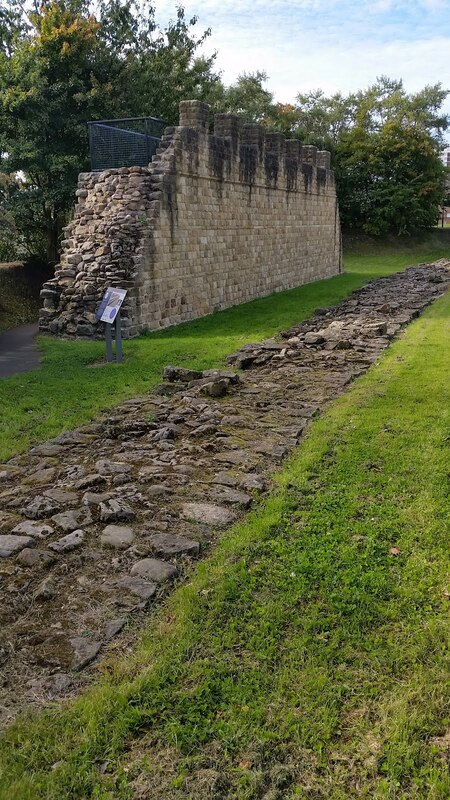 Another showed where all the Wall Walkers who visited the museum came from. 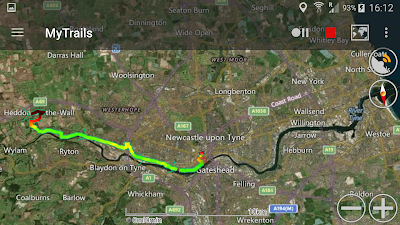 I stuck my pin in the appropriate spot. 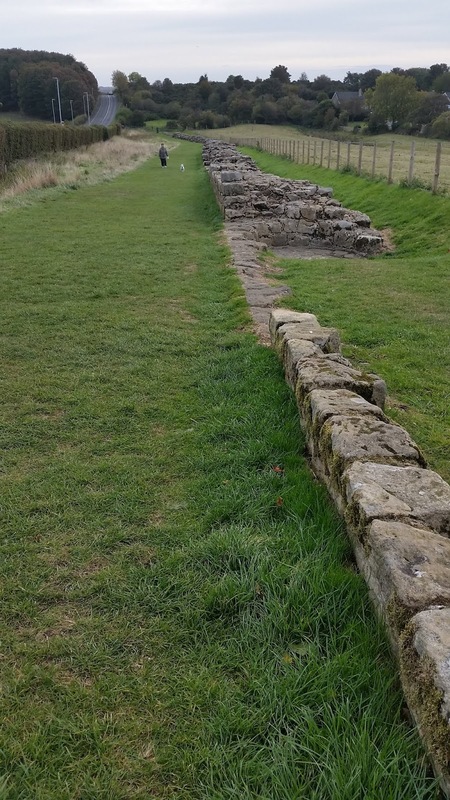 A section of Wall has been reconstructed alongside the remains of the old Wall, to give visitors an idea of how tall it was, how it would have looked, and what it feels like to walk along the top of it. 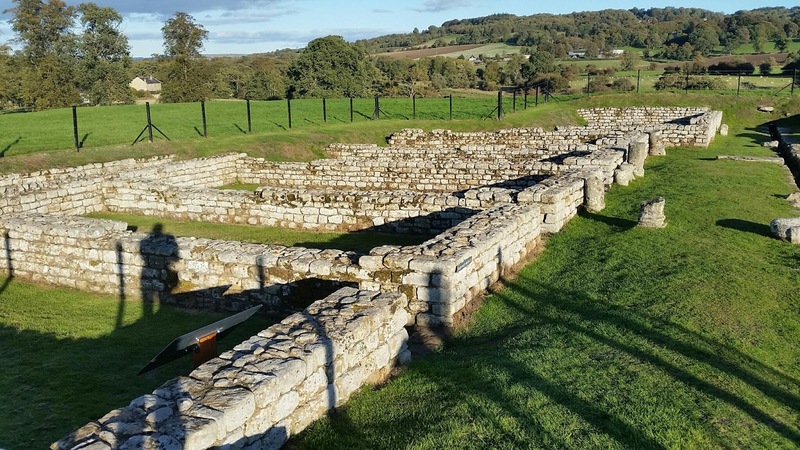 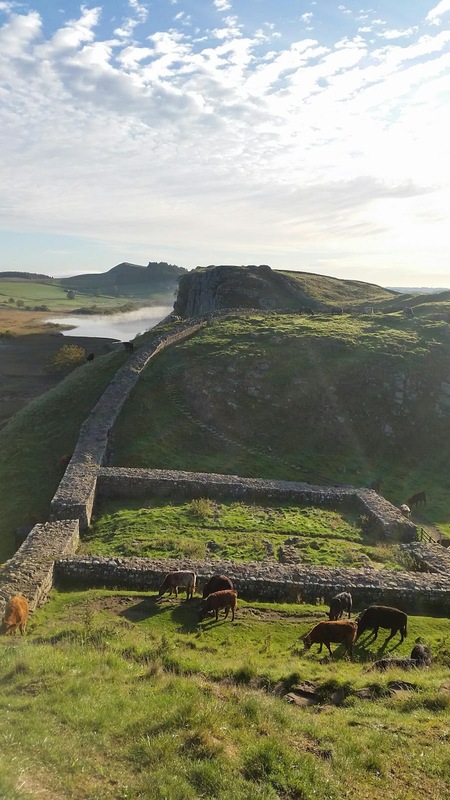 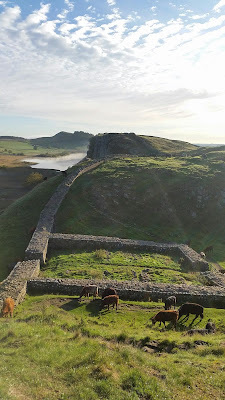 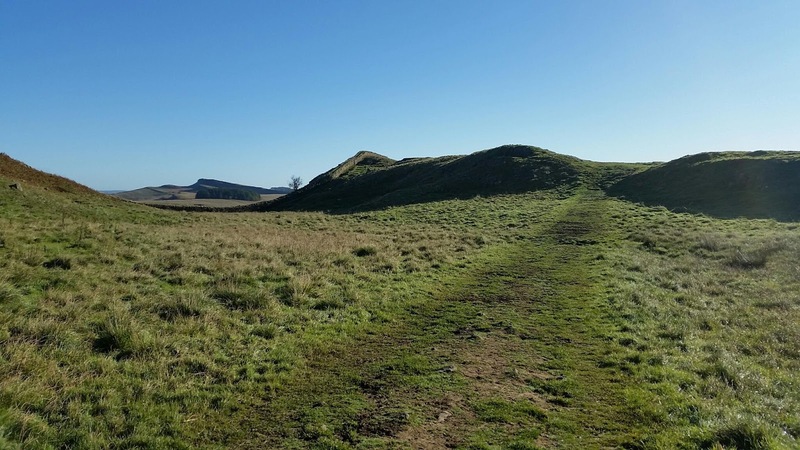 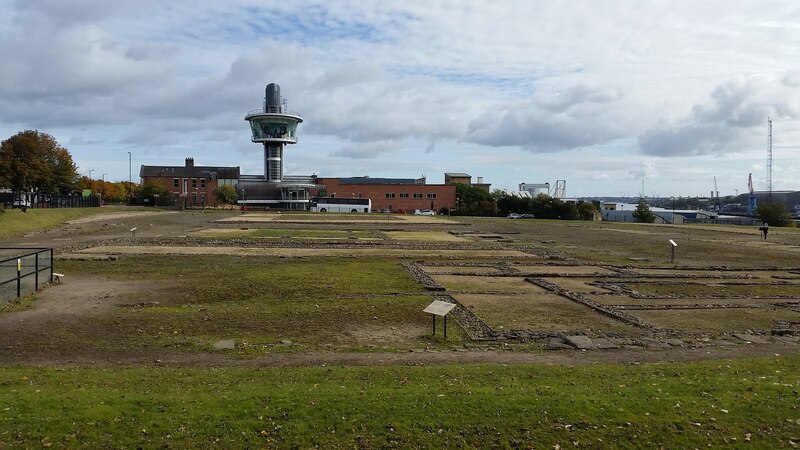 Segedunum marks the end of Hadrian's Wall and the end of Hadrian's Wall Path. 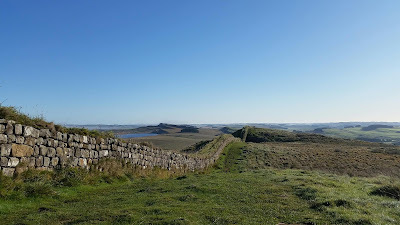 But after visiting the site, getting the final stamp on my Hadrian's Wall Path Passport and collecting my certificate of completion, I carried on along Hadrian's Cycle Path for another ten kilometres to Shields, to make it not only a complete Wall walk but a complete coast-to-coast walk, from the Irish Sea to the North Sea! 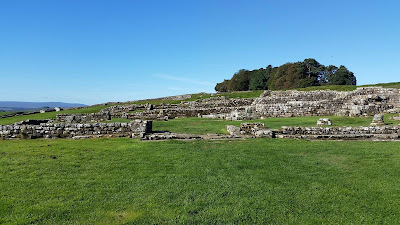 At North Shields I boarded a ferry across the Tyne, a seven-minute journey to South Shields, site of the Roman fort of Arbeia. 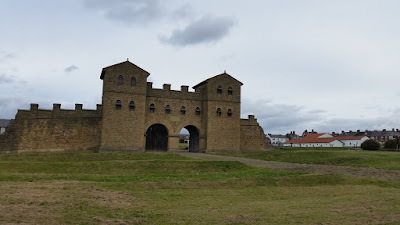 The gatehouse of the fort has been reconstructed to give you an idea of what it would have looked like in the days of the Roman Empire, and admission is free.... but sadly the site is only open May through September, and today being the first of October, it was closed. 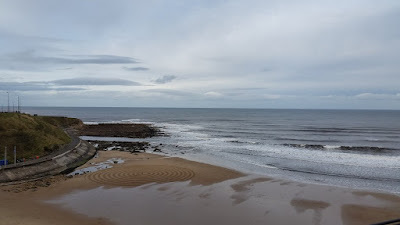 I peered at it through the gates and then carried on past "Hadrian's Primary School" and down to the beach at the mouth of the River Tyne on the North Sea, where I finally stopped tracking my walk! 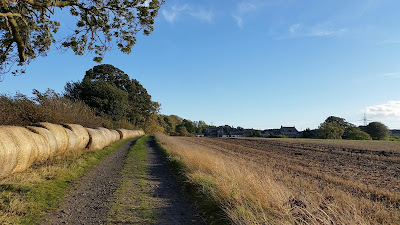 This was the end of my walk, but not of my adventure. 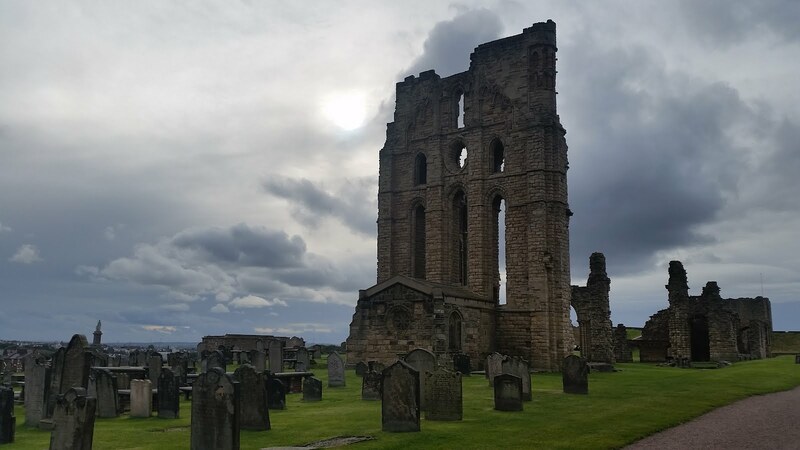 I took the ferry back over the river and then a bus into Tynemouth to visit the ruins of Tynemouth Priory, perched on the top of a cliff over the pounding waves of the North Sea. On the beach below the ruined Priory, a woman was drawing concentric circles in the sand. 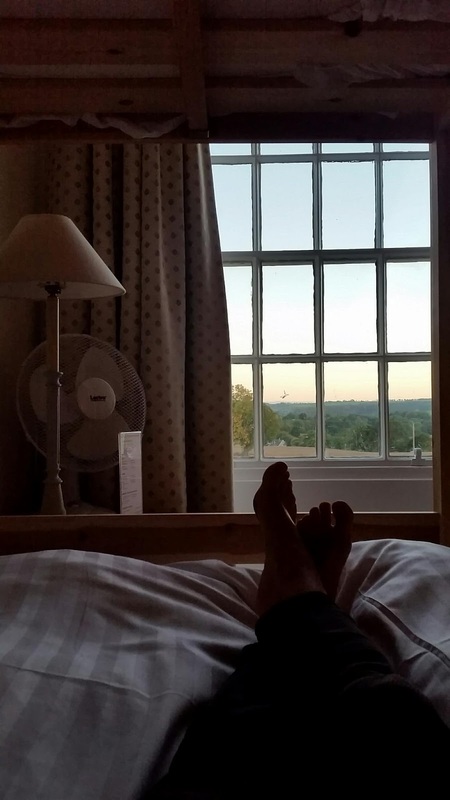 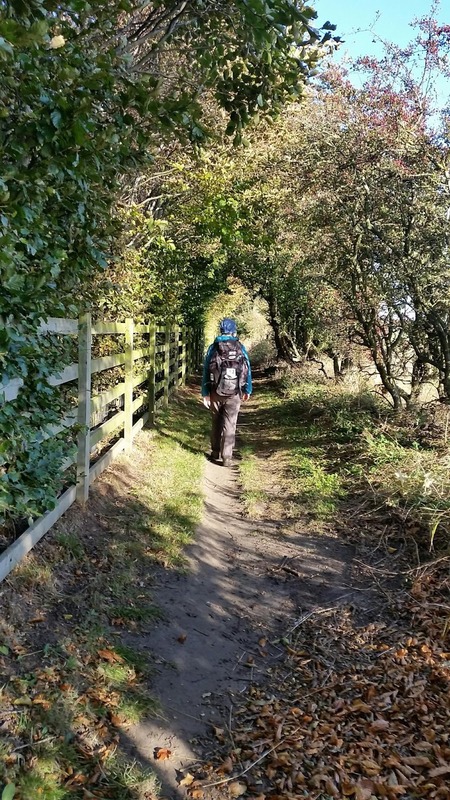 But then, why did I walk across England? 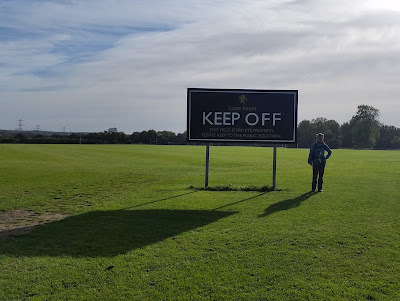 It makes just about as much sense! 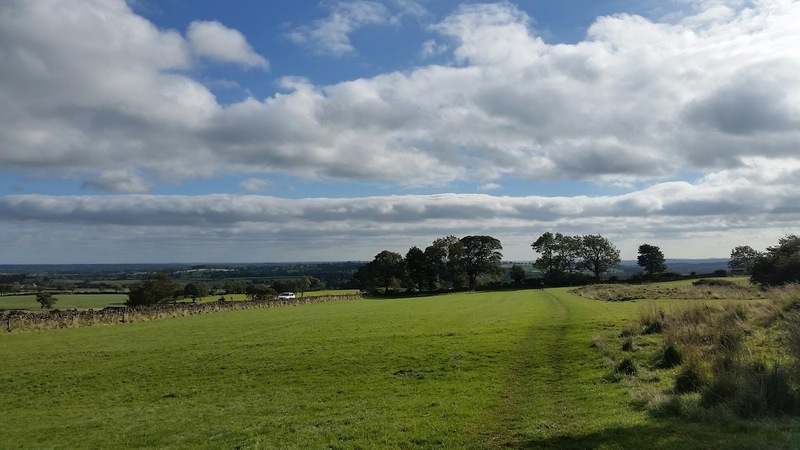 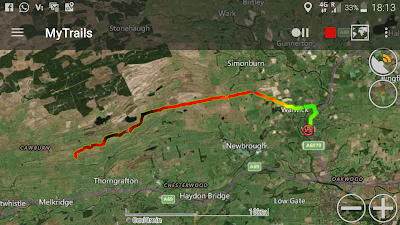 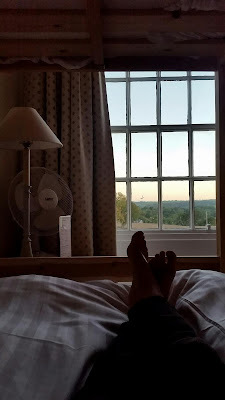 After breakfasting in the company of another walker and the proprietor of Houghton North Farm hostel, Jennifer and I set off at a good pace towards Newcastle - but before we had got very far, we were waylaid by villagers in Heddon-on-the-Wall. First we stopped to look at the longest section of broad Wall (i.e. 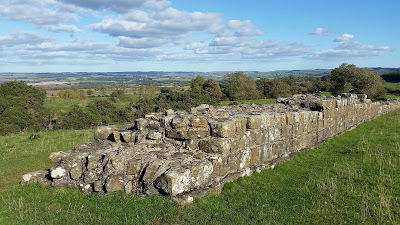 ten-foot rather than eight-foot Wall) still standing. 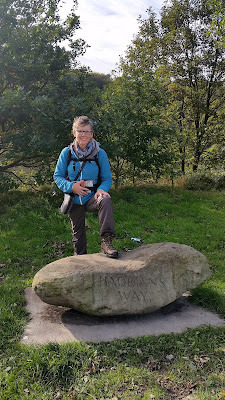 Before we had been there a minute, a very friendly lady with a small terrier came along and struck up a conversation. 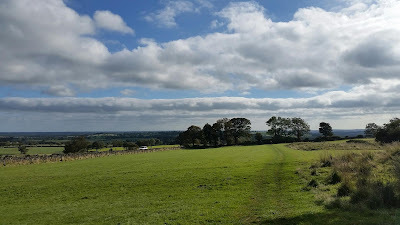 She started out talking about her dog, and then about the horses in the adjacent field, but when she got onto the topic of the Royal Family, we knew we were going to have a hard time escaping; luckily a group of cyclists arrived at the site, distracting the terrier and therefore its mistress. 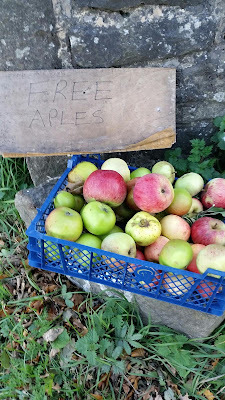 We beat a hasty retreat, but shortly thereafter made the mistake of entering the village church, St. Andrew's. It being Sunday morning, a service was about to start, and when we told the attendant at the door we just wanted to take a peek at the church before proceeding on our way along the Wall, he embarked on a personal tour of the church, which he defined as "just a quick look round before the service" but which went into considerably more detail than we had bargained for. 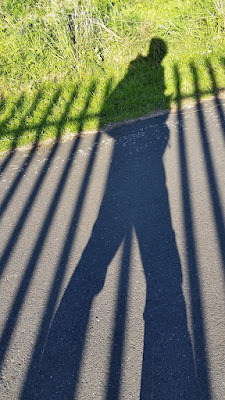 However, a crisis arose when a desperate parishioner called to his attention the fact that the priest had failed to arrive for the service, and once again we were able to make an escape, at the price of paying 20 p for a brochure explaining the details of the church architecture and stained glass windows that the attendant hadn't had time to illustrate to us himself. 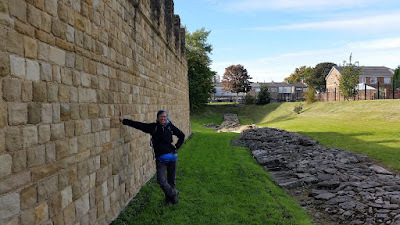 A long stretch of broad Wall - with friendly lady & terrier approaching! 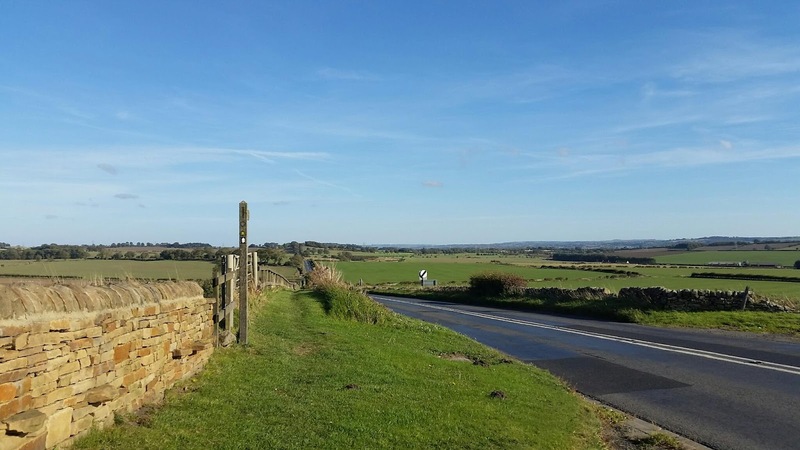 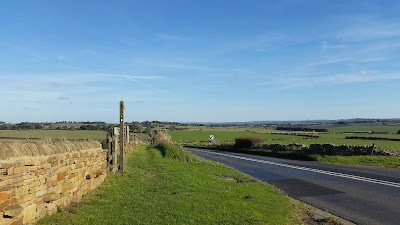 Once we finally managed to leave behind the extremely friendly inhabitants of Heddon-on-the-Wall, we were able to proceed towards Newcastle at a reasonably rapid pace, there being little else to distract us along the way. 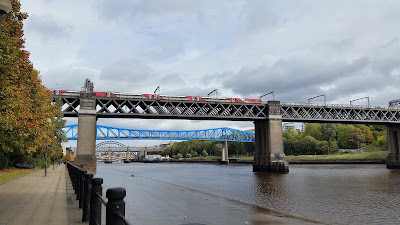 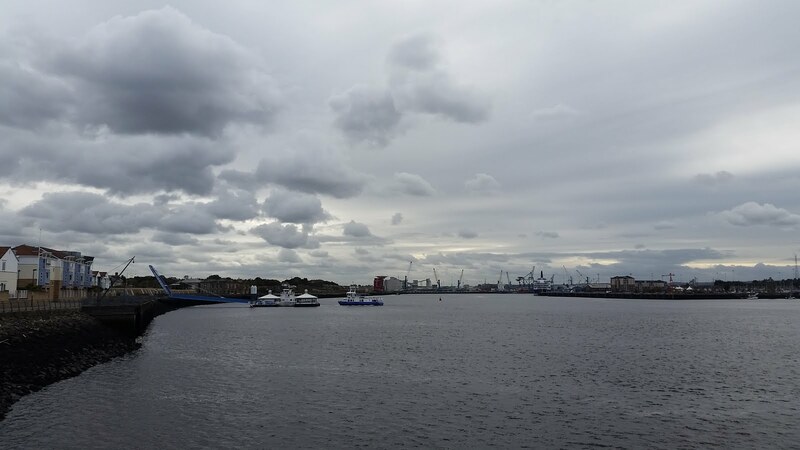 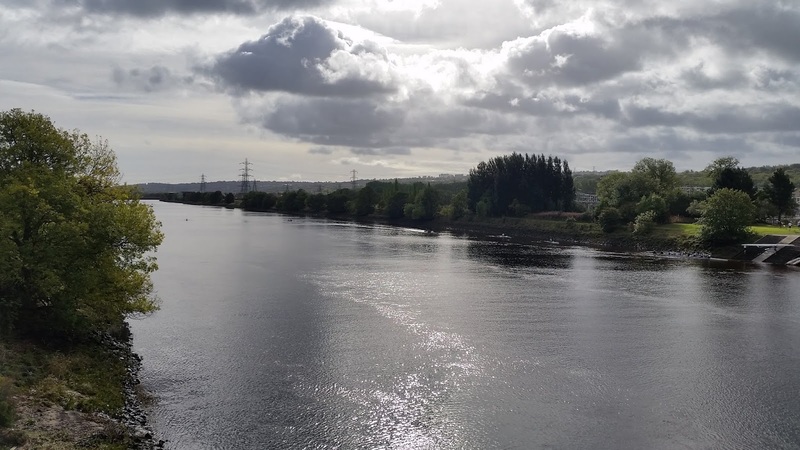 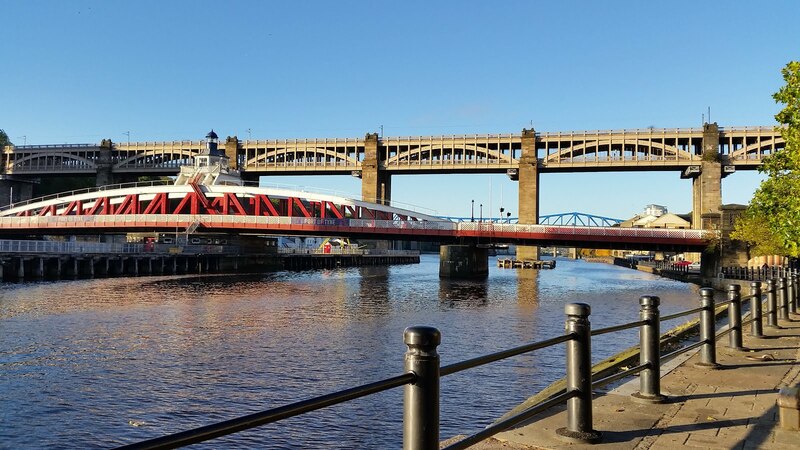 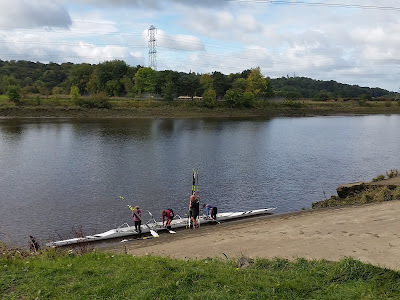 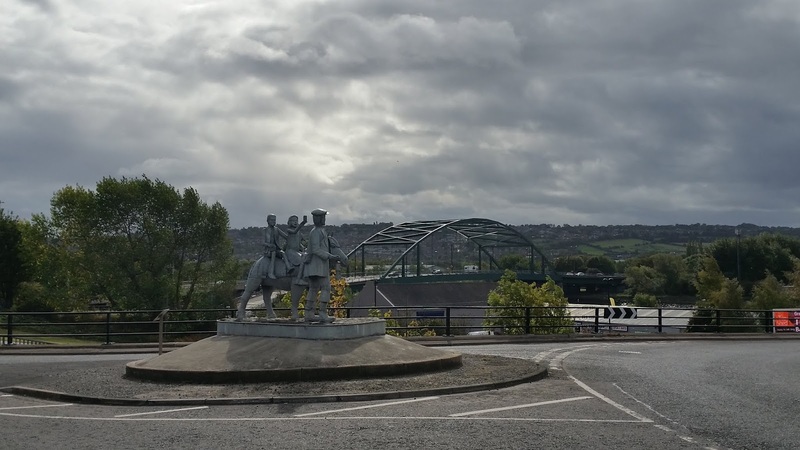 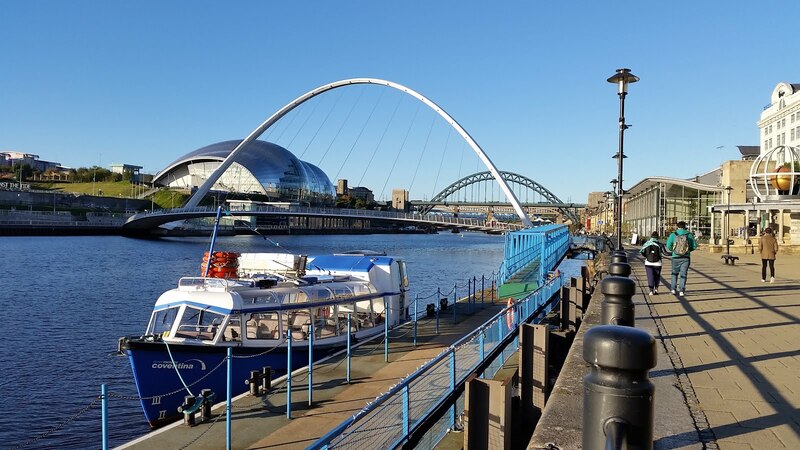 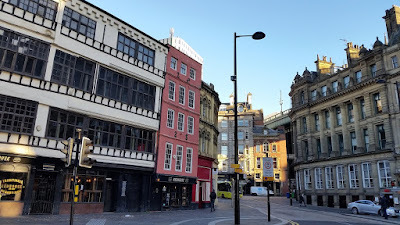 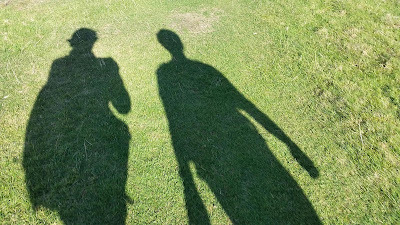 It was a pleasant walk along the north bank of the Tyne, past a golf course, cricket grounds and a rowing club, through parkland on the site of former coal mines, past a fragrant baked goods factory and on into an increasingly urban landscape. 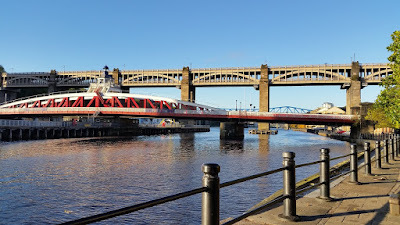 At Newcastle Central Station I said goodbye to Jennifer, off to rejoin her family for the working week, and checked into my hostel, where I recovered a small bag of things I had sent ahead care of Hadrian's Haul, did some grocery shopping and bought a waist pouch at the five-pound shop to replace the one with a broken zipper that I had thrown away! 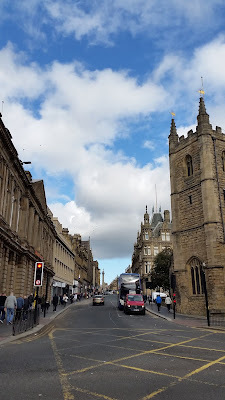 Grainger Street - on the way to the hostel! 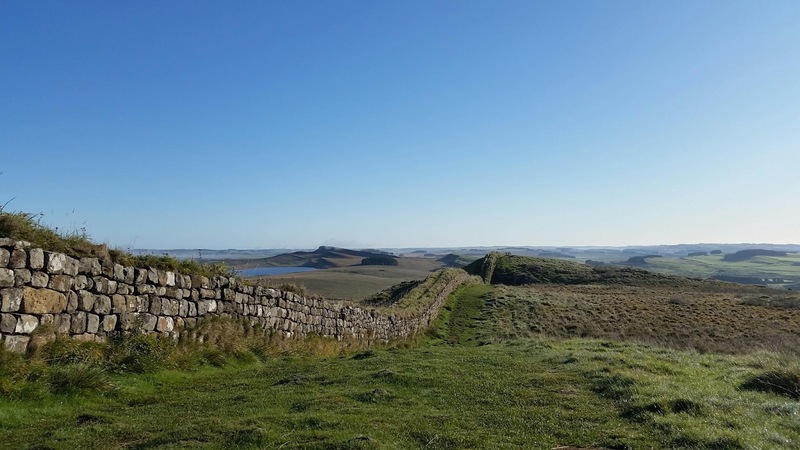 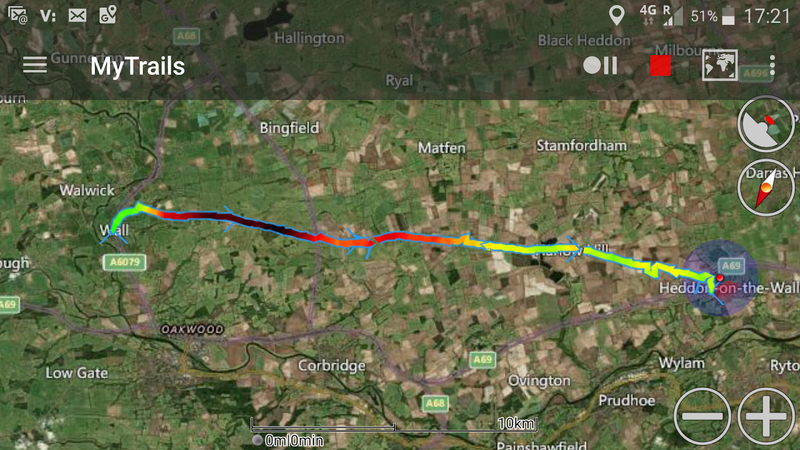 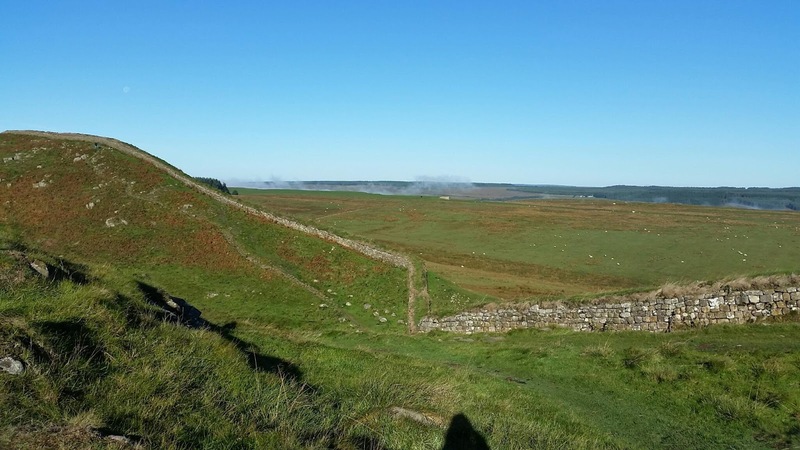 After a delicious dinner and a restful night at Hadrian's Hotel, we resumed our walk eastwards from Wall. 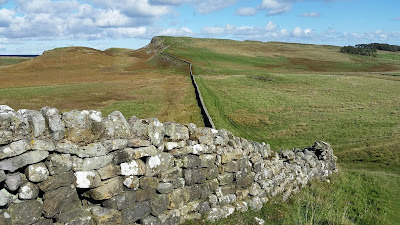 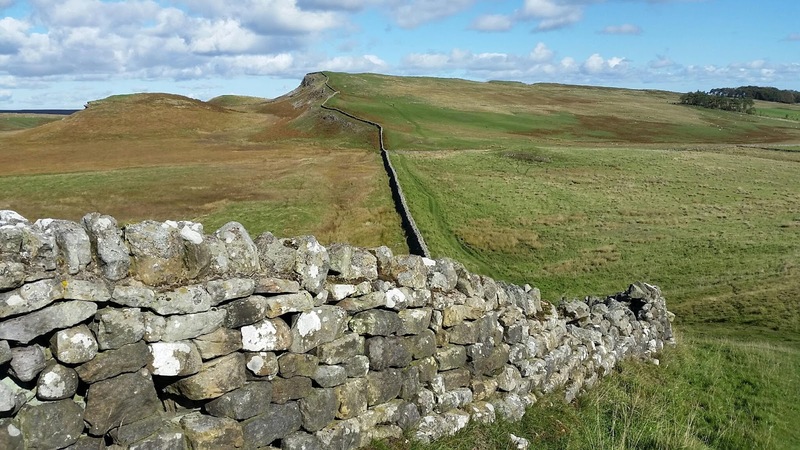 Despite the abundance of wall-related place names, the Wall itself appears only occasionally above ground in this part of Northumberland. In many places it is underground, even under the highway, and so for much of the day our path followed the course of the modern-day road. 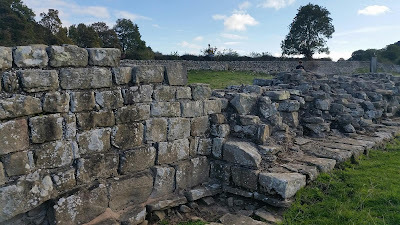 One bit of Wall we did see is at the spot where, due to budget cuts, the thickness of the wall was reduced from 10 to 8 feet. 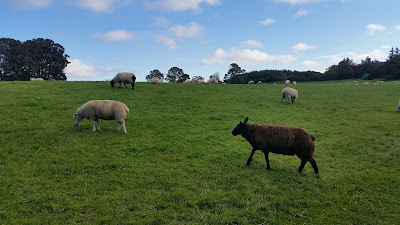 The black sheep in the family! 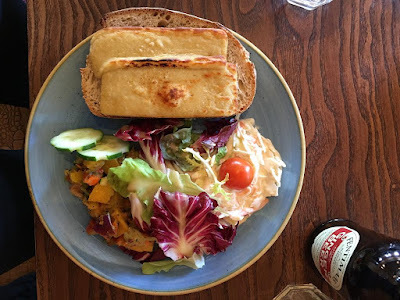 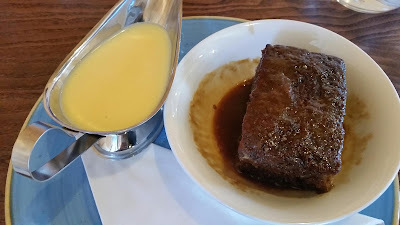 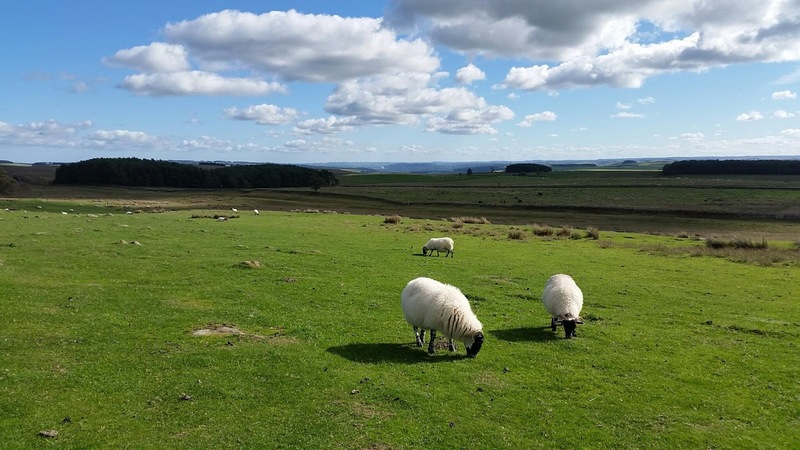 Towards noon the wind came up and blew us across the fields and right into the Vallum Farm Tea Room, billed as "The foodie gateway to the wall", where we enjoyed an excellent lunch of rarebit followed by sticky toffee pudding with custard! 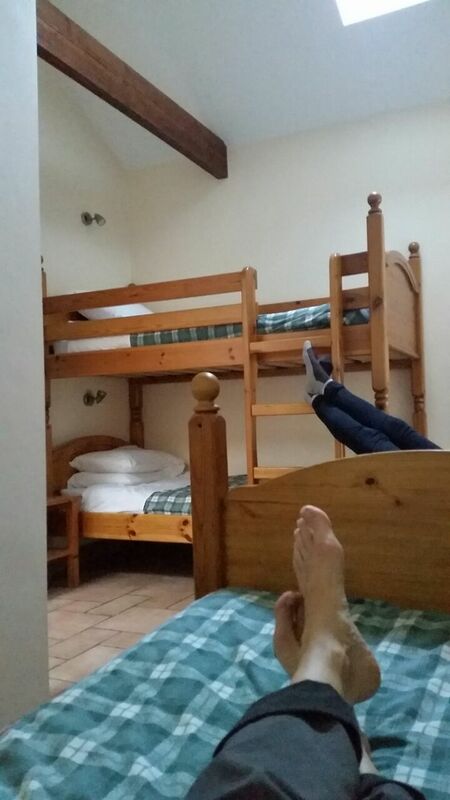 Another ten kilometres and we reached our destination, the hostel at Houghton North Farm, where we dined on instant soup, cheese scones and apples... plenty of apples! A clear morning, with a touch of frost on the grass! 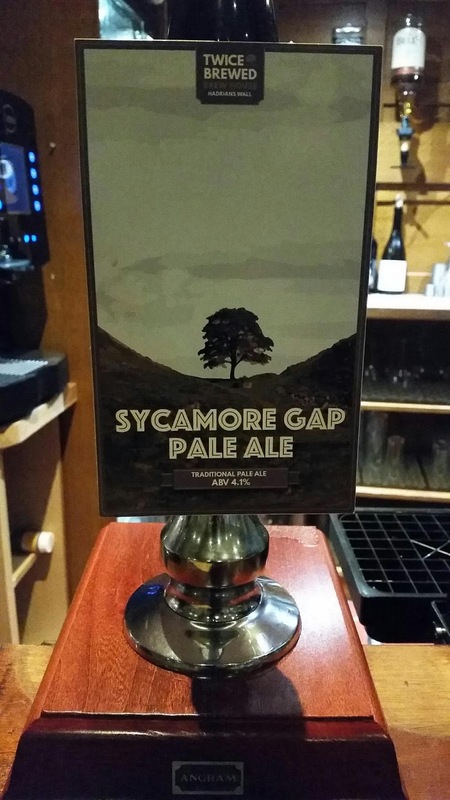 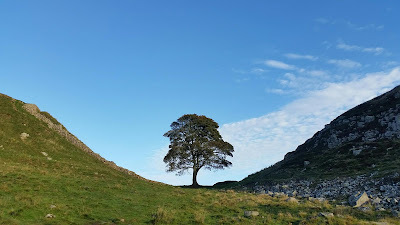 I climbed back up the crags at Steel Rigg, past milecastle 39 and into Sycamore Gap, among the most iconic spots on the Wall. 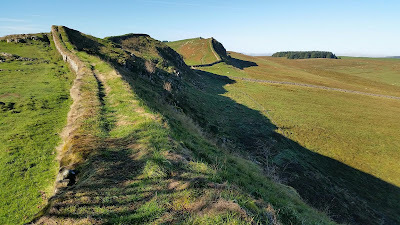 From the top of the succeeding crag I could look back at Peel Crag and Crag Lough and forward along a beautiful stretch of good solid Wall snaking up and down the slopes. Sometimes, to avoid going up to the top of every single crag, I followed the route if the ancient Roman Military Way behind it. 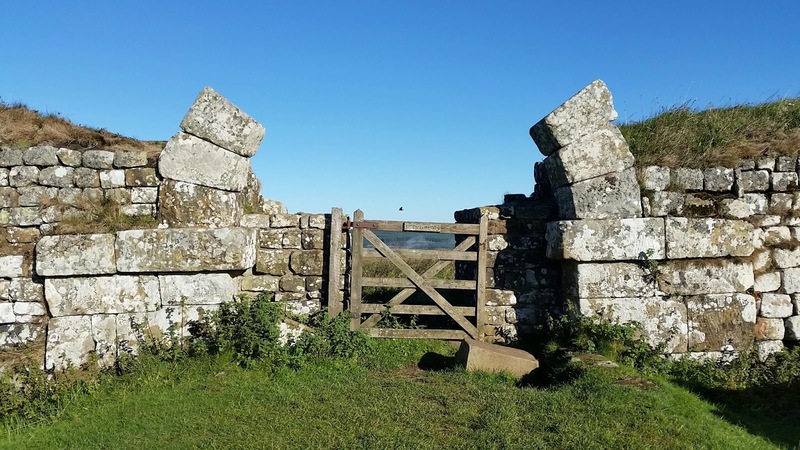 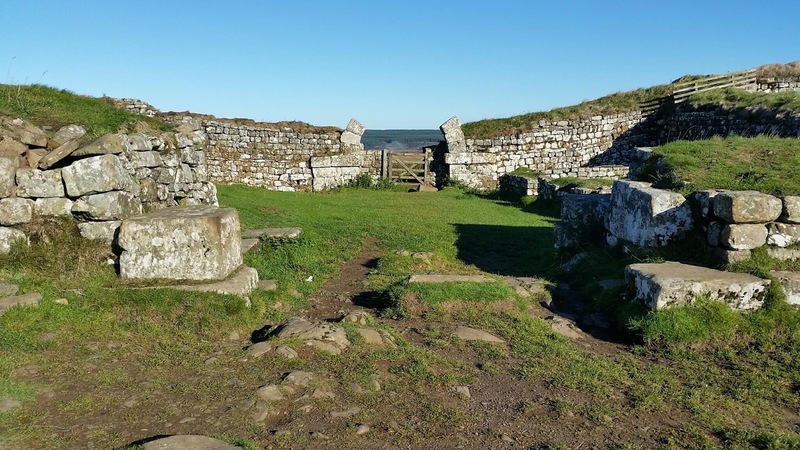 At milecastle 37, part of the arch over the north gate has survived. 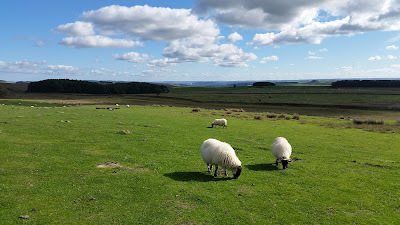 I stopped here to enjoy the sunshine. 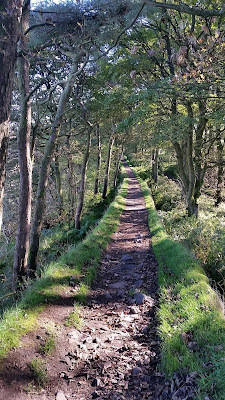 There followed a short section through the woods where the path is actually on top of the Wall. 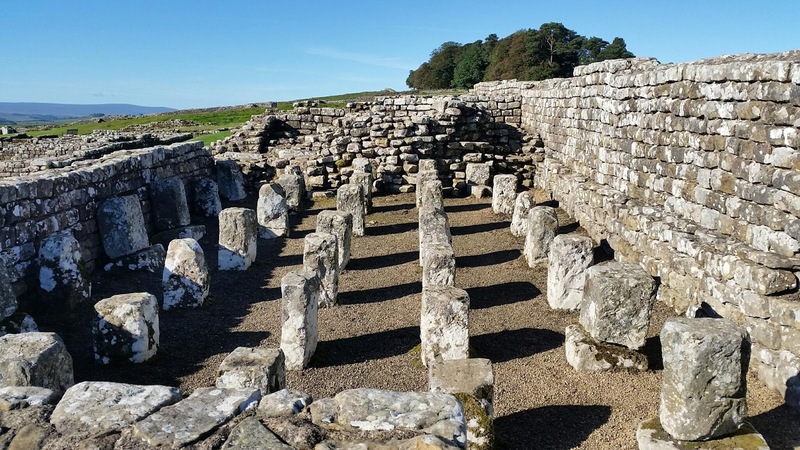 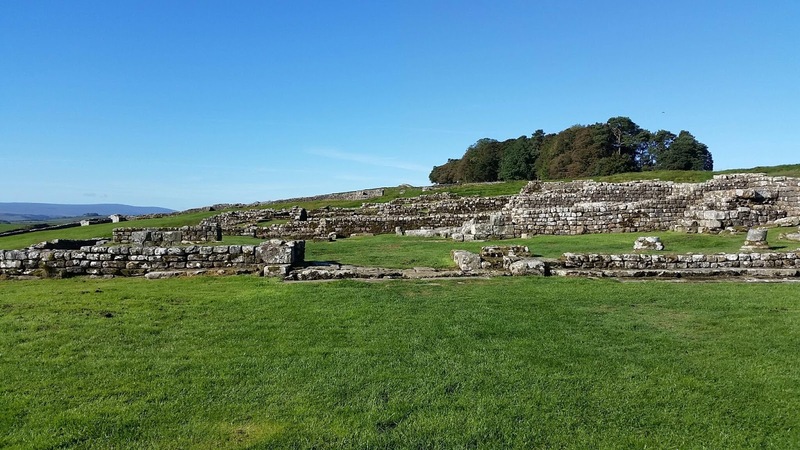 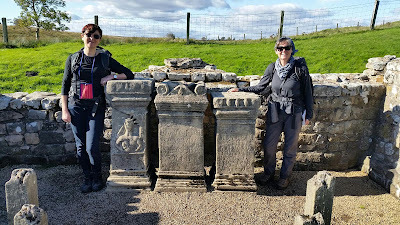 At Housesteads Roman Fort I visited the museum and the ruins, and met up with my life-long friend Jennifer, who has come to walk with me for the weekend! We proceeded together along a beautiful stretch of Wall as the Crags gradually levelled off, stopping for lunch at the temple of Mithras in the unexcavated fort of Brocolitia. From here the presence of the Wall became less continuous. 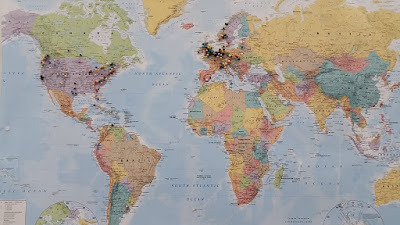 Born in England, grew up in Canada, I have lived in Italy for more than half of my life now. 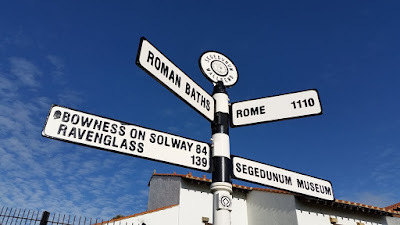 I divide my time between Liguria and Tuscany. 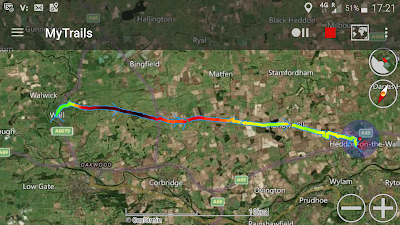 In September of 2015 I set off to walk from one to the other. 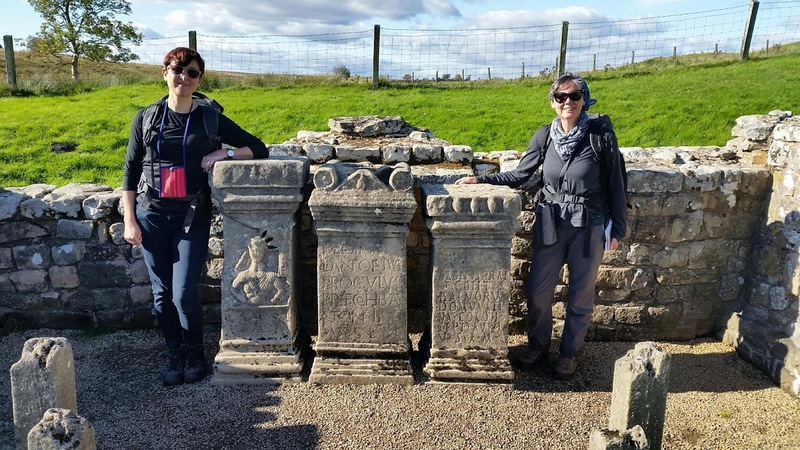 And I enjoyed it so much I continued on to Rome! Since then I have meandered around Italy on some other trails.... in Abruzzo, Liguria and Tuscany. 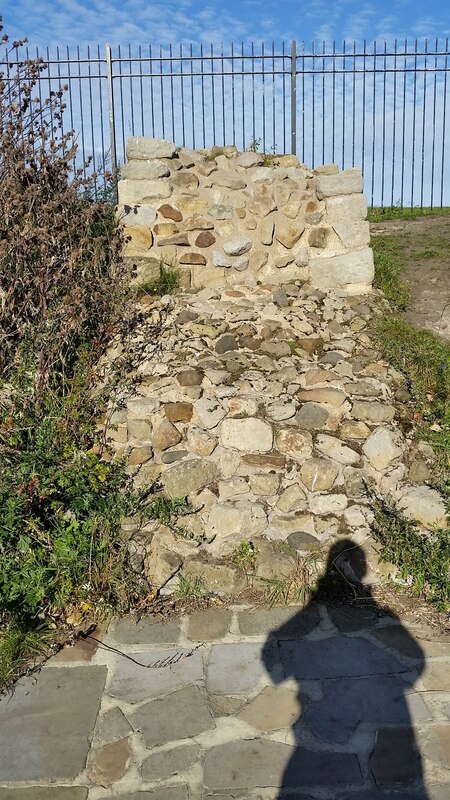 In October 2016 I set off on foot again in the opposite direction, to the border with France. 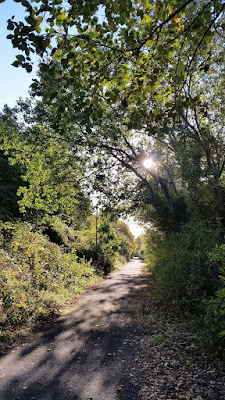 In October 2017 I continued on from the French border as far as Montpellier. And in April 2018 I took up the trail again in Montpellier and walked as far as Toulouse. I am now almost halfway from home to Santiago de Compostela! 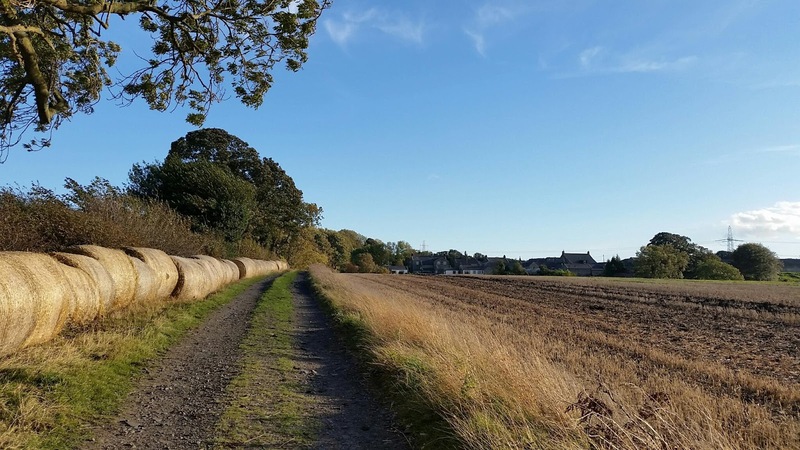 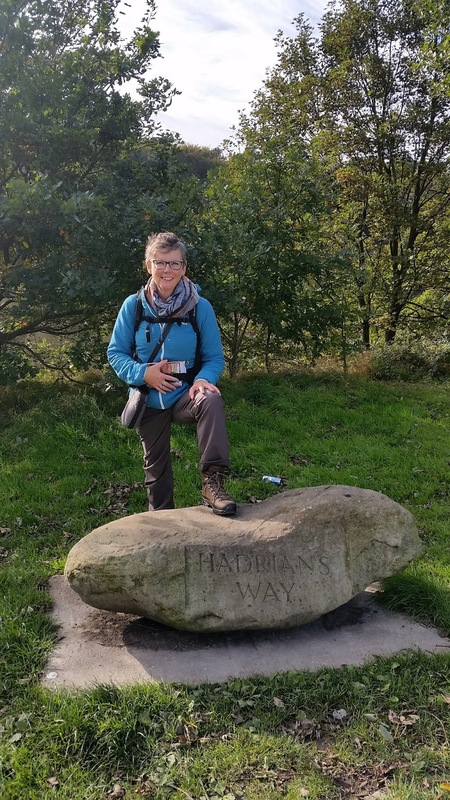 Read all about these walks in "Joanne's Long Walks". In the summer of 2017 I crossed North America - but not on foot! 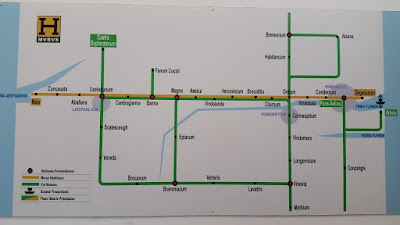 5000 km is too far to walk in one summer, even for me, so I took the train. And an assortment of buses and ferry boats... this is the subject of "The Cross-Continental Gallivanter".